The Intel Xeon E5-2697 v2 is a high-end processor for workstations and server (maximal two sockets). 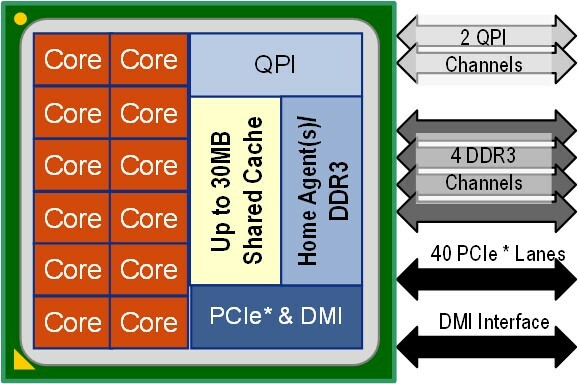 It is based on the Ivy-Bridge-EP architecture and offers 12 cores that are clocked with 2,7 to 3,5 GHz (turbo Boost). Instead of an integrated graphics card, the E5-2697 offers a huge 30 MB level 3 cache. The 4-channel memory interface is able to cope with up to 768 GB DDR3-1866. The CPU is specified with a TDP of 130 Watt and therefore needs a big desktop grade cooling system.